I have occasionally had to admit that I gave myself an out in the tagline for this site, “bringing notable wristwatches to enthusiasts.” You see, the vast majority of pieces that I find intriguing were either innovative for their time (in mechanics or design) or succeeded in attaching themselves to important points and people in history. De Bethune is, at the moment, a little young for those accolades. But I have little doubt that they are coming to them in time. Significance is always best assessed through a historical lens. Hindsight is 20/20, right? However, like all of you, I can fall deeply in love with a piece (like this De Bethune DB25) and feel a need to write on it regardless of the mission statement. So here we go. 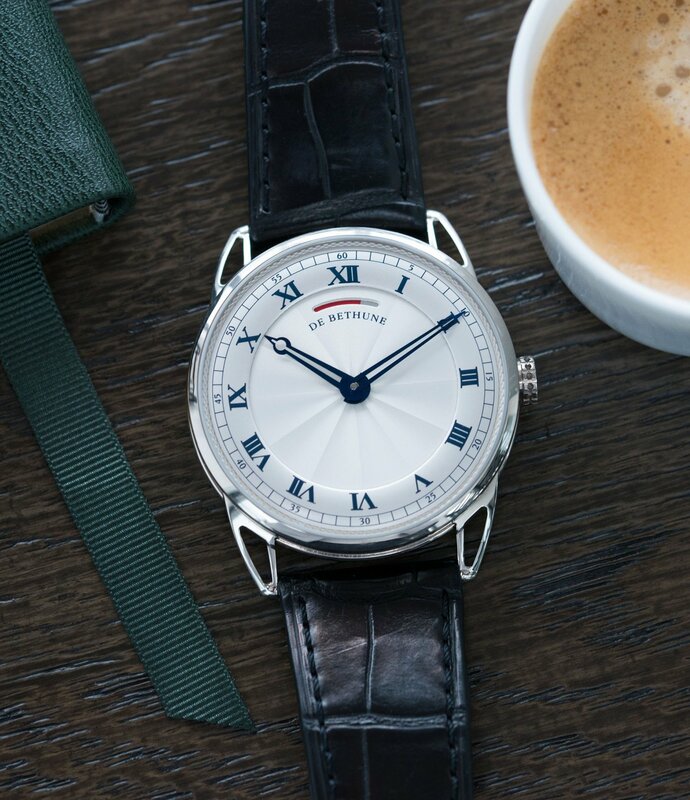 In 2002, De Bethune was created in the namesake of Chevalier de Bethune–an eighteenth century nobleman who has been credited with the invention of many modern mechanisms of horology. From creation in 2002 until the turn of the 2010s, De Bethune was a kind of best-kept secret of Geneva. They labored in shadows creating masterpieces. These spaceships of watchmaking and the generations of evolution they spawned gained DB a sort of peer approval amongst the old of Geneva by winning the Aiguille d’Or’ distinction (at the Grand Prix d’Horlogerie de Genève), casting them into the limelight. It was around this period of acclaim that the piece we see here was born. The DB25WS1 is a statement of formal, ingenious luxury. With a linear 150 power-reserve (you read that correctly) at 12, titanium-platinum winding rotor, some type of proprietary friction-reduction witchcraft, a parachute-based shock absorption system, and beautifully hewn titanium bridge, it’s little surprise that they couldn’t restrain themselves from a display case back. Rightly so. This caliber is just an exercise in childish eye-candy that would make any true enthusiast weak at the knees. The example shown here is dressed in white gold, a favorite amongst modern sharp-dressers. I particularly like the reliefs in the lugs, reminiscent to my eye to something like the flying buttress on the new Ford GT. The blued Roman numerals and hands would contrast a navy or beige jacket to a tee. The guilloché dial work sheds light with the grace you would expect from a much, much more experienced manufacturer. There are many other points of note but for the sake of time I’ll stop pouring over it. Honestly, I’m not sure I can add any comments of note to a piece that represents itself so strongly. Find it for sale here from the reputable folks over at A Collected Man for 21000 GBP.